For classic Texas barbecue with a waterfront view, take your appetite to the lake. : You can’t have too much of a good thing when it comes to Texas barbecue, so it's no wonder the first County Line on the hill was replicated in a beautiful lakeside location. The approximately 20-minute drive from downtown is likely time better spent than waiting in a line for ’cue, especially when considering this outpost’s spacious outdoor seating on the redwood deck that edges the water. 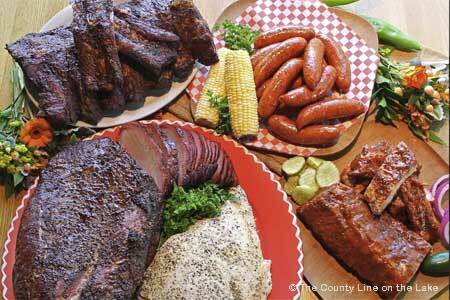 Offerings from the pit are rightly famous and served with County Line's tangy sauce. Pink-tinged beef brisket is smoked over fine oak and carved thin, while homemade sausage is juicy and piquant, with just the right seasonings. When we want something lighter, we order the smoked turkey breast or the grilled salmon. Traditional family-style sides such as pinto beans, coleslaw and thick homemade bread are essential for a true Texas barbecue experience. Blueberry cobbler topped with vanilla ice cream is the signature dessert.